We’d love your help. Let us know what’s wrong with this preview of Keep Me, Cowboy by Nicole Helm. To ask other readers questions about Keep Me, Cowboy, please sign up. The third book in the Montana Born Rodeo series, gives us the return of Cole McArthur to Marietta, Montana and the reconnection between him and his first love; Jess Clark after his departure ten years previously without even a ‘goodbye’. This was a book of two halves for me, I was really enjoying the chemistry that was building between Jess and Cole, especially as you are given the reasons of his departure back when they were teenagers, what knocked the rating down a little for me was the McArthur family in general, as the author gave them some pretty unlikeable and irredeemable qualities. "I will always care... Whether I should or not." It was however a very quick read, and everything was resolved before I had much of a chance to build up a head of steam behind my dislike, and it had a pretty sweet ending as well. This book was received free via Netgalley for an honest review. My review is below. This book is a punch to the gut. In a broken family, it's hard to be the extra. And that's exactly who Jess is - the adoptive daughter, forever trying to be good so she will be loved, can stay. It's even harder when you're in love with one of your stepbrothers. And she is, very much. But Cole has left her and Marietta. He has no intention of coming back. Unfortunately, it's Jess who has to persuade him to come hom This book was received free via Netgalley for an honest review. My review is below. This book is a punch to the gut. In a broken family, it's hard to be the extra. And that's exactly who Jess is - the adoptive daughter, forever trying to be good so she will be loved, can stay. It's even harder when you're in love with one of your stepbrothers. And she is, very much. But Cole has left her and Marietta. He has no intention of coming back. Unfortunately, it's Jess who has to persuade him to come home, deal with family, and deal with her. There have been some pretty dysfunctional families in the Marietta lexicon, but I'm not sure any of them come close to the McArthurs. It all starts with Dad. He's autocratic, demanding, unbending, and generally acts unemotional. Unfortunately those traits have pervaded the family. He drove off his son Cole with an ultimatum that shattered Jess's heart. He doesn't treat any of his kids well and keeps secrets from his wife. But suddenly Dad is in trouble. So Jess steps in and tries to make it all better. And her actions finally crack and then demolish the facade. The whole family ends up reeling because of the secrets that come out. Against this backdrop of family pain, upheaval, and betrayal, Cole and Jess must find out if their 10 year separation will forever tear them apart or if they can try and find a way back to each other. The crux of their issues now is communication and they both decide (independently) to get with it and start talking. Both are hurting, Cole because of his father and Jess because of Cole. I am at 41% and nothing is happening other than Cole and Jess thinking deep thoughts about what they wanted and didn't want and what happened in the past(which hasn't been revealed yet. And then more about what they wanted and didn't want until I wanted to shake the pair of them. There is no conflict or tension or even plot here. Just two people who spend pages thinking deep introspective thoughts without getting anywhere. i couldn't care less about either of them. Not for me. Not rating at this I am at 41% and nothing is happening other than Cole and Jess thinking deep thoughts about what they wanted and didn't want and what happened in the past(which hasn't been revealed yet. And then more about what they wanted and didn't want until I wanted to shake the pair of them. "I don't know who I am. All I've ever done is look for family, and no one wants that from me. So, I don't know who to be." These two. Man they made my heart hurt. Jess is a former foster kid who has only ever wanted to fit in and be part of a family but is finding out that maybe the family she thought she fit with and tried so hard to be a part of the past ten years...doesn't see her the same way. She's sweet and earnest and just lovely. And Cole. Well he's spent his whole life feeling like an outsider in his own family. Never good enough. Never right. So he bailed instead of sticking it out. It hurt watching them both deal with their feelings and trying to figure out who they were all these years later. To themselves and each other. And how they fit with the family that was breaking their hearts, as well. The romance is heartbreaking, too. So much hurt and frustration between them. So many lost years. But they were sweet together and I loved watching them heal and find each other again. All in all, Keep Me, Cowboy was an emotional read. Not just with the romance but the family behind them as well. Seeing them own up to the years of not listening to one another, not sharing their feelings or really acting like a family. Seeing them all try to put the past behind them and move on to something better and whole. Things aren't perfect when everything ends but there's hope and change happening and it's a heart warming thing to see. This is the third book in the Montana Born Rodeo 2015 series. Sorry for repeating myself but it still applies - Each book works well as a standalone, each is written by a different author but they do have some of the same characters in them and, of course, key events like the rodeo are also common to all the books. I am still so highly impressed by how these authors work so well together, I actually feel like I’m starting to know my way around Marietta through their descriptions! This time ex fos This is the third book in the Montana Born Rodeo 2015 series. Sorry for repeating myself but it still applies - Each book works well as a standalone, each is written by a different author but they do have some of the same characters in them and, of course, key events like the rodeo are also common to all the books. I am still so highly impressed by how these authors work so well together, I actually feel like I’m starting to know my way around Marietta through their descriptions! This time ex foster child Jess Clark is going to see her teenage sweetheart, Cole McArthur, to try to get him to come home again after a decade away from his family, friends and home in Marietta. She’s actually going because his father has been diagnosed with MS and she feels the family needs to reconnect with each other, even though she isn’t really one of them. Cole is a rodeo cowboy who was given an ultimatum by his father; he’s never forgotten Jess and no one has ever come near to measuring up to her in his heart. When he finds her at his door their attraction is still explosive but with family secrets, shocking revelations, misunderstandings and so much more do they stand a chance of achieving their HEA? You’ll have to read it to find out! This is another wonderful, sweet novella in this series - again, a delight to get lost in. The dreadfully poor communication between members of McArthur family causes so much trouble for them all. Reading as Jess develops from something of a doormat to a more forthright, feisty young woman is delightful. Similarly as Cole faces his own dilemmas and starts to understand his own reactions better all adds to the dynamics of their relationship and the story. An emotional journey that it is a roller coaster ride with plenty of twists, turns, ups and downs to keep the reader enthralled. A great story to get lost in, highly recommended! Thanks to the author, publishers and NetGalley, too for provided an ARC for me to read in exchange for this, my honest review. A broken family, emotionally unable to connect and communicate, with secrets and lies, betrayal and manipulation. All Jess ever wanted was to be part of a family, but everyone she has loved, has left her without warning or explanation. She let the McArthurs treat her as a servant, and made herself believe she was part of the family. One of those who left her is Cole, and now ten years later she is willing to manipulate and lie, to get Cole back into Marietta, so she could fix the broken McArthur f A broken family, emotionally unable to connect and communicate, with secrets and lies, betrayal and manipulation. One of those who left her is Cole, and now ten years later she is willing to manipulate and lie, to get Cole back into Marietta, so she could fix the broken McArthur family, in thanks for what they have done for her. Little does she know, it was Dr McArthur, who made Cole to leave, with her as the target of the extortion. There is so much pain from the past, and heartache of the present in this novella. Not just between Cole and Jess, but the whole dysfunctional family is crumbling. The communication skills between the family members are nearly non existent. And they don't seem to even care, or willing to try. I felt frustrated through the story, I just couldn't relate to them, or understand why they were so stubbornly hurting the people they are supposed to care about. Nothing is solved in the story when it comes to the family, and the issues they face. Jess and Cole found some kind of happy for now, let's try to work thing out, at the end. I felt this novella stirred a bee's nest called McArthur family, and left the angry bees to fly around. For a novella to start a family saga, this would have been a perfect story to get the interest, but for a third book in a series of the rodeo, I was left a bit confused and unsatisfied. Hopefully the next book in the series has lots of answers for us. Keep Me, Cowboy is a second chance love story between two people who had different priorities in life when they first met but has now come into a turning point in their lives after ten years. This was quite an emotional book, full of regrets, repressed feelings and lots and lots of misunderstanding. Cole has issues with his father that had spilled out unintentionally to his early relationship with Jess. But he hasn't really forgotten what she meant to him. Jess on the other hand has been fooling Keep Me, Cowboy is a second chance love story between two people who had different priorities in life when they first met but has now come into a turning point in their lives after ten years. This was quite an emotional book, full of regrets, repressed feelings and lots and lots of misunderstanding. Cole has issues with his father that had spilled out unintentionally to his early relationship with Jess. But he hasn't really forgotten what she meant to him. Jess on the other hand has been fooling herself into believing that she doesn't deserve more than what she has and in fact is feeling grateful that Cole's family has decided to foster her as a young teen. When they finally meet again because of family circumstances they now had to confront what they were before and how to go beyond it. Cole as a character was very difficult to like, but you get a very good sense of how much remorse and regret he has for leaving Jess behind with no explanation. Now Jess had the most development in this book. From someone who barely acknowledges herself as an individual deserving of more, she in turn realizes that she needs to find out who she really is without this constant need of getting by and being taken for granted. Overall, Cole and Jess journey back into each other was dealt really well and is probably what makes this story worth reading. 1. Cut down on the inter dialogue, each chapter would have maybe a rough page of conversation and the rest inter struggles, doubts, fights, guilt. 2. Jess is weak with a capital W. She is a doormat, her so-called family not by blood, treats her like an employee, call her by a different name and she's too scared to correct. 3. Also Cole is a coward, when life got rough he ran, for 10 years until Jess came and lied to get him home. 4. Where is the connection between Jess and Cole and where is it to the reader? I had to force myself to finish this and I still had to skip around (you won't miss anything if you did). 3.75 out of 5 ~ Continuing on with my cowboy loving theme lately I found myself downloading a free copy of Keep Me Cowboy by Nicole Helm. Having just finished another I downloaded via Overdrive I jumped right into this one having loved her writing style. Keep Me Cowboy is part of a multi author series called Montana Born Rodeo (77th Copper Mountain Rodeo). Now normally I can’t handle reading things out of order in a series but generally what I’ve found happens with these types of multi author is 3.75 out of 5 ~ Continuing on with my cowboy loving theme lately I found myself downloading a free copy of Keep Me Cowboy by Nicole Helm. Having just finished another I downloaded via Overdrive I jumped right into this one having loved her writing style. Keep Me Cowboy is part of a multi author series called Montana Born Rodeo (77th Copper Mountain Rodeo). Now normally I can’t handle reading things out of order in a series but generally what I’ve found happens with these types of multi author is they can be read separately or together. They normally don’t hinge plots through these types (but I’ve seen some that do). I have zero idea if that is what happens with this series and the plot flow does leave some questions that may indicate a follow through. Keep Me Cowboy is a novella about Jess Clark and Cole McArthur. The McArthur name is a prominent name in Marietta, Montana and Cole is the black sheep of said family. Jess comes from a broken home, foster home after foster home finally landing at the door of the well to do McArthur family. Jess and Cole become friends and then typical teenage crush ensues. Cole leaves town abruptly and 10 years later Jess shows up on his doorstep looking to bring him home. Jess has longed to belong to someone, anyone, who would love her and care about her and not leave or abandon her. Her biological father was abusive and her brother was “trouble”, they separated the siblings but she has been searching for him every since. Jess started building a relationship with Cole only to have it end suddenly. She didn’t know why people don’t stay with her. Cole felt stifled by his family, wanting him to become a doctor and follow the medicine footsteps they felt he was destined to follow. He heard the call of the rodeo and answered. His big regret was leaving Jess behind. He felt he made the right choice 10 years ago by walking away but now he isn’t so sure. Can he be strong enough to not walk away again? This novella, as most are, is too short to fully build a backstory for me. I wanted to know more about the why’s in the past not the quick build to getting people back together. The author does a pretty good job about trying to answer as many questions as she can but I’m still left with a bunch. I’m curious now if any of the novellas previously or future will address my questions. This review has been hidden because it contains spoilers. To view it, click here. Standard love story- high school sweethearts, guy splits without a goodbye. He does it because he thinks it’s best. The story irritated me- not badly enough that I gave up reading but enough that I skimmed a lot. He main character was stuck on belonging, and chose sweetheart-guys family, who are all unrepentant jerks, and don’t care about each other or her, yet she spends at least 10 years trying to ingratiate herself. She seemed to bend over backwards for her father figure that she had to call Standard love story- high school sweethearts, guy splits without a goodbye. He does it because he thinks it’s best. The story irritated me- not badly enough that I gave up reading but enough that I skimmed a lot. He main character was stuck on belonging, and chose sweetheart-guys family, who are all unrepentant jerks, and don’t care about each other or her, yet she spends at least 10 years trying to ingratiate herself. She seemed to bend over backwards for her father figure that she had to call Dr. MacArthur. The conflict between the two was pretty ho hum, but very irritating that the author made it so the wronged party felt obliged to ask for an apology for her guy up and leaving her without a goodbye or an explanation. Then suddenly it’s all okay and they are together. It was a nice, short read. Second chance not only for the lovers but for a whole family. I must say at the beginning I was thinking such a typical second chance story but there was a twist which will take you to the another stories in the series. It was good but it didn't blow me away but still good 3,5 stars! A family that needs communication skills, a girl who believes that their world should be better, a cowboy who did not fall for the dad's wishes, and a few other interesting twists. Part of a series. Sweet romance. Cole and Jess were high school sweethearts but circumstances pulled them apart. Ten years later the catalyst that tore them apart reunites the pair, inadvertently. So many family secrets must be dealt with if these two want a fighting second chance. A reasonable read though I do hate books finishing way before 100%....this one finished on 80%. Was poorly written. Several if the pages never showed up in the book. Or the publishers forgot to see that they. We're downloaded. I was getting bored at the beginning. Then about the middle you got into it. Then the end comes . What a good short story of young love, family obligations and rekindled love. This is the first book I've read by Nicole Helm. I can't wait to read more. 3.5 stars. Oh, Jess! How I felt for her throughout this book. Those McArthur’s are quite the bunch, and this book definitely asked more questions concerning them than it answered. But more on that later. After a miserable childhood spent with an abusive father and bouncing in and out of foster homes, Jess has always wanted a place to belong. Once she’d thought she’d found that in Cole, but they were young and Cole had troubles of his own. When he left without a word, Jess tried to make a place fo 3.5 stars. Oh, Jess! How I felt for her throughout this book. Those McArthur’s are quite the bunch, and this book definitely asked more questions concerning them than it answered. But more on that later. After a miserable childhood spent with an abusive father and bouncing in and out of foster homes, Jess has always wanted a place to belong. Once she’d thought she’d found that in Cole, but they were young and Cole had troubles of his own. When he left without a word, Jess tried to make a place for herself within his family, and has been content with that ever since. But now troubles within that same family have sent her out to track Cole down and beg him to return – regardless of her pride. Because that’s the sort of person Jess is, selfless and willing to do almost anything for those she loves. Her need to belong is so strong that she feels like she constantly has to prove herself to ensure that she’s worthy. Although perhaps she wouldn’t feel like that had she chosen a different family to latch onto. To say the McArthur’s are cold would be an understatement. They’re also selfish and self-absorbed, and even though Cole is the opposite of his father in many ways, he does share some of his less loveable traits. It’s easy to see why Cole isn’t fond of his family – they’re all brainy doctors and cold hard facts, while all he ever wanted was to ride the rodeo, while believing in instincts and fate and soul mates. Yet despite that more sensitive side, when it comes to Jess he’s still as guilty of taking from her as everyone else. The difference is that he does give something back – understanding, support, love. He’s also stubborn and prone to believing he knows best without even asking for Jess’ opinion, so it’s unsurprising that he and his father can’t compromise. But although the family drama in this story is ostensibly more about Cole, Jess’ own emotional tale was more important for me. How she begins to open her eyes to the real family and see the truth about her place within it, as well as how others start to see her differently too. This might only be a short read, but I really loved seeing Jess transform from the quiet yes-girl into a confident woman not afraid of airing her opinions. Especially to a family in desperate need of telling off. Oh, those McArthurs. Cold and unlikeable, and yet they’re an interesting bunch. I definitely got the feeling that there’s plenty of unfinished business hanging around the lot of them, not least Cole’s brother’s marriage. I hope they’ll be showing up in Marietta again soon. So if you're looking for a short read with a stubborn cowboy, family dramas and a thoroughly likeable heroine coming into her own, then you should give this a try. I can't wait to see what this year's rodeo has to offer next. Jess and Cole had been teenage lovers, okay maybe not true lovers but teenagers in love. Right up until the moment Cole left Marietta without a word, and without a backward glance. Left his home, his family and the girl who loved him and that he loved as well. Ten years later, Jess is determined to get Cole back to Marietta. Back to the family that needs him, even if they are too proud and stubborn to admit that fact. And if she’s honest with herself, back to her as well. He’d destroyed her when he left. Everyone left her, so it shouldn’t have hurt so much but this was Cole. He was supposed to be hers. Until he proved that wrong as well. Cole never intended to return home. Home is where the heart is was just a silly old saying, except that his heart really had stayed with Jess. Even when he couldn’t. The rodeo was his world, even though his father had forbade it. This was the only career he’d wanted. He also wanted Jess at his side, but his father also made that impossible too. He wasn’t a damned doctor and never would be, but you couldn’t tell the old man that. Keep Me, Cowboy is an engaging story of how family can truly create havoc and chaos within its circle. People rarely change, but circumstances can bring about changes that no one ever expects. Jess needed answers. Cole needed to give them to her. While not a run off and get married story – this is the story of a hard fought for second chance to see what could be if two people who loved each other really committed to their future. I enjoyed this story very much. I would recommend Keep Me, Cowboy for anyone who loves second chances, a complex family dynamics and a really good love story. how did Cole and Jess meet? what job does Jess do? do you like the cover for Keep Me, Cowboy by Nicole Helm? who is your favorite character in this story? will Cole and Jess be more than friends? what does Jess ask Cole to help with? the number of books in the Montana Born Rodeo series? only man who’s ever claimed enough of Jess heart to break it. the name of the man? Cole only ever loved one woman. what was the woman name? I got a free advanced reading copy in exchange for an honest review. I highly recommend reading Keep Me, Cowboy by Nicole Helm. Keep Me, Cowboy by Nicole Helm is a 5 stars book. Keep Me Cowboy is the third in the 2015 Copper Mountain Rodeo series. Although it is part of a series, it stands alone nicely as the setting in gorgeous Marietta Montana and the timing of the book around the annual rodeo are the only real links between the books in this series. This book tugged at my heartstrings a little. There was a lot of hurt to he healed but also a lot of love to be rediscovered, which was a far from easy process for those involved. Jess Clark grew up in one foster home after Keep Me Cowboy is the third in the 2015 Copper Mountain Rodeo series. Although it is part of a series, it stands alone nicely as the setting in gorgeous Marietta Montana and the timing of the book around the annual rodeo are the only real links between the books in this series. Jess Clark grew up in one foster home after another, finally coming to the Mc Arthur family in her teens. She's never felt as though she belonged anywhere nor has she ever felt loved or cherished so she's determined that this time this family will take her in and make her one of their own. Trouble is the McArthurs are not known for their shows of affection. The other problem Jess faces is Cole Mc Arthur. Cole is a year older than Jess, and became the love of her life when she was seventeen before leaving her, his family and Marietta with no goodbyes, no explanations and no backward glances. Cole has never buckled down and done his father's bidding. He's made a successful career for himself on the rodeo circuit and he has no intention of ever returning to Marietta. He is shocked to the core when Jess turns up on his doorstep and even more shocked to find he still wants her just as fiercely ten years after leaving her as he did when he left. Note: This ARC was provided by Tule Publishing in exchange for an honest review. 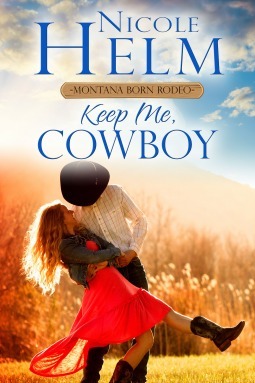 Keep Me, Cowboy by Nicole Helm is the third novella in the multi-authored 2015 Montana Born Rodeo series and is a second chance romance between Cole McArthur, a rodeo cowboy, and Jess Clark, a nurse. They fell in love ten years ago but Cole's decision to leave Marietta led to a lot of hurt and unanswered questions on Jess's part. When the reason for his departure i Read the full review on Bookaholics Not-So-Anonymous. 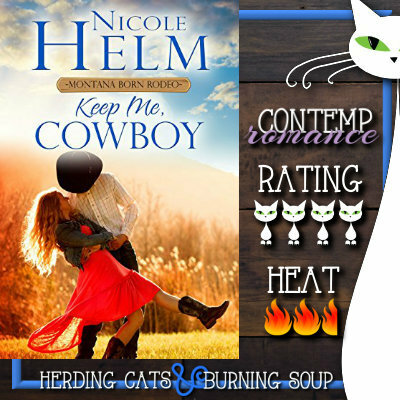 Keep Me, Cowboy by Nicole Helm is the third novella in the multi-authored 2015 Montana Born Rodeo series and is a second chance romance between Cole McArthur, a rodeo cowboy, and Jess Clark, a nurse. They fell in love ten years ago but Cole's decision to leave Marietta led to a lot of hurt and unanswered questions on Jess's part. When the reason for his departure is brought to light, the first thought in my head was how much time these two people lost because of one person's manipulations, even though it's revealed that the maneuvering was done with the best of intentions. Their respective lives may have moved forward, but it's clear they were stuck as far as being with a potential love interest was concerned. After a falling out with his family ten years ago, rodeo cowboy Cole McArthur left Marietta and never looked back. He lived his dream of being a rodeo cowboy. Cole's father needs him now and Jess Clark is willing swallow her pride and confront Cole to get him to come back home. Cole broke Jess's heart ten years ago, but she will do what she needs to do in order to reunite father and son again. Jess grew up moving from one foster home to the next. She worked hard to become a nurse and make somethi After a falling out with his family ten years ago, rodeo cowboy Cole McArthur left Marietta and never looked back. He lived his dream of being a rodeo cowboy. Cole's father needs him now and Jess Clark is willing swallow her pride and confront Cole to get him to come back home. Cole broke Jess's heart ten years ago, but she will do what she needs to do in order to reunite father and son again. Jess grew up moving from one foster home to the next. She worked hard to become a nurse and make something of her life. The McArthurs gave her a sense of family and she would do anything for them. Jess lied to get Cole back home. She told him The Copper Mountain Rodeo wasn't doing as well and If he made an appearance, he might be able to save it. Cole may not have returned if he knew the real reason Jess wanted him at home was because his father was diagnosed with MS and he was getting worse. Jess only planned on Cole being home for a weekend. When he arrives a week early, Jess isn't prepared. She still has strong feelings for him and staying together for a week will be a real test for her. As they work through their differences, Cole and Jess eventually find themselves in each other's arms. Now that Jess and Cole have worked through their problems, will Cole be able make amends with his father before it's too late? This was an emotional book. Jess and Cole were both very stubborn when it came to letting go of the past. Together, they discover how important love and family is, and sometimes it requires some extra effort to work through the differences. You can contact her via email: Nicol Nicole Helm is the bestselling author of down-to-earth contemporary romance and fast-paced romantic suspense. From farmers to cowboys, midwest to the west, she writes stories about people finding themselves and finding love in the process.